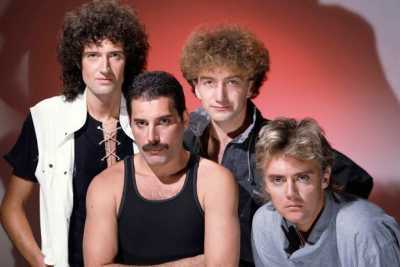 The legendary Queen star Brian May has told how he uses an old-fashioned form of virtual reality to keep the memory of Freddie Mercury alive. 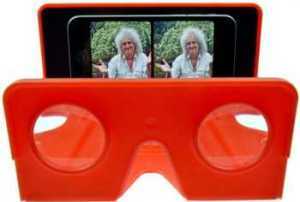 Brian spent decades taking special photographs of the celebrated front man using a Victorian technique called stereoscopy to produce stunning 3D images. Until today, there has been no way for the 68-year-old rock god to easily share these astonishingly lifelike portraits with the world, because they need to be looked at through a special viewer. Now the Queen guitarist has released a brand new device called the OWL , which will give millions of fans the chance to see these stunning images of Queen in all their pomp. 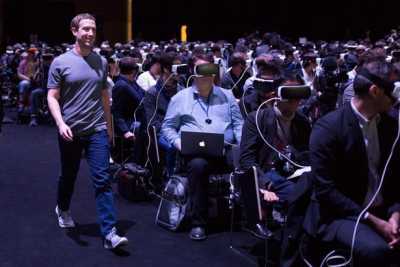 At a demonstration of his new gadget yesterday, Brian showed journalists how it could also be used to view the very latest virtual reality films and games, allowing ordinary people to enjoy cutting-edge technology without breaking the bank. "Photographic portraits are always magical, but when it's a 3D portrait it's so real that it's almost painful," he told The Mirror . "I have beautiful pictures of Freddie in all his magnificence and in full health. Now he isn't here anymore, this is the closest thing to being able to see Freddie and look him in the eye. Losing Freddie was like losing a family member. You have that inside of you and carry it forever. Sometimes you connect to it, just for a moment." Brian's love of stereoscopic photography is almost as old as his love of music. His passion started when he began to discover old Victorian snaps which created a 3D illusion using two normal images - a similar technique to modern virtual reality. These pictures were taken from two slightly different angles and then viewed through a special device, fooling the eye into seeing a three-dimensional image. "I used to dream of being able to share stereoscopic images with people, but it needed a special camera and viewer," he added. "Now what's thrilling me is that I can share this stuff with everyone and it's so instant." 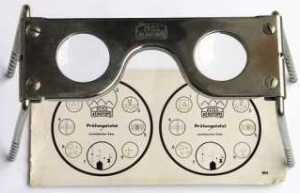 The Owl will cost just £15 and is produced by the London Stereoscopic Company, which was founded in 1854 and revived by the Queen guitarist in 2008. It works in a similar way to Google's Cardboard device. Users can magnetically attach their smartphone to the OWL and then peep through the viewer and see images, films or games in 3D without strapping a heavy helmet to their head. The smartphone also responds to movement, allowing OWL owners to look around a virtual world. 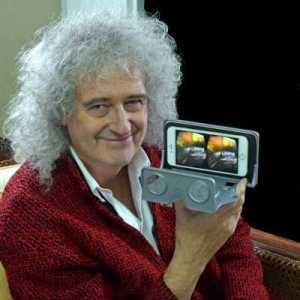 At the demonstration yesterday, Brian also showed off an animated virtual reality music video for Bohemian Rhapsody, made by Google, which could be viewed through the OWL. 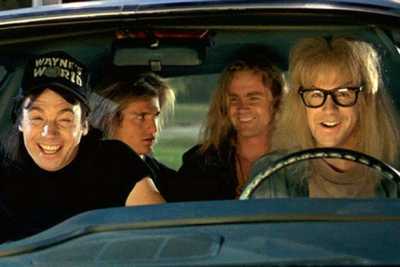 He declined to say whether he preferred the Google-made version of his hit song to its depiction in Wayne's World (right above), which showed the film's long-haired stars headbanging to Brian's seering guitar solo. "I loved Wayne's World," he continued. I took it to Freddie, who didn't have long to go, to get his approval. He loved it too." However, the rock star admitted to being in two minds about modern virtual reality. "There will be good and bad to VR," he said. "Some people will never go out of their rooms, which is probably not healthy, but it will be a way of educating people in a way they haven't been educated before." He suggested people would use the technology to create their own personal realities, which some would never want to leave again. But he also suggested his fellow conservationists could use the new tech to produce films that allow viewers to put themselves in the perspective of a hunted animal. He continued: "Virtual reality will bring a lot of good and darkness too. We need to deal with the darkness." 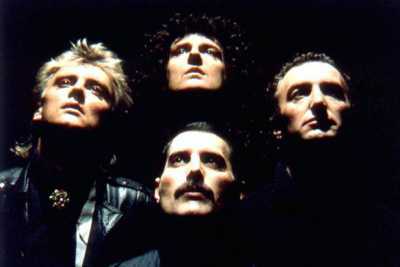 Brian is about to release a book called Queen in 3D which he will collect images of the band taken in their seventies and eighties heyday as well as more recent images which can be viewed using the OWL. He has previously published a similar tome called Diableries: Stereoscopic Adventures in Hell , focusing on 1860 depictions of the underworld, and Crinoline , showing off stereoscopic images of highly flammable dresses worn in the Victorian era. Both these books feature images which can be viewed in three dimensions using the OWL. David G Burder, former president of The Stereoscopic Society and The International Stereoscopic Union, said: "This is the finest Stereoscope to appear in the last 120 years. In future there will be no point in producing a stereoscopically illustrated book without an OWL." Brian has also been working on a top secret VR project with NASA, although details of this program are being kept hush-hush at the moment.